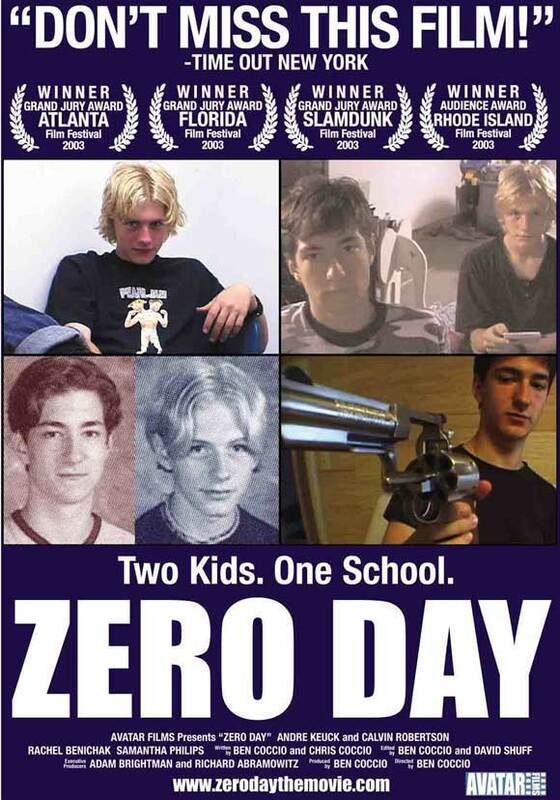 unlike bang bang you’re dead, zero day is inspired by the columbine massacre. it was originally scheduled to be released in the fall of 2001, it probably wasn’t the best time for a mockumentary on school violence. it was finally released in september 2003 on one screen earning about $7,000 in two weeks. structured like a year’s worth of vlog entries before video blogging was a thing, the film follows cal and andre (played by cal robertson and andre keuck) chronologically as they plan an attack on their school, along with footage of their daily life like going to the dentist, going to a party, at home and at work with their parents…etc with a specific date on screen in between footage. i don’t know what it is about found footage movies but this is the only genre i can think of that somehow manages to bring out the doucheiness in any characters. cal and andre are not as bad as most in the genre since the blair witch project but they are dragged down by the footage we see in the movie. most of which are longer that needed. zero day is a 45 minute movie stretched out to 90 minutes. comaprison to elephant is perhaps unavoidable, the gus van sant school shooting movie came out about two months after zero day. while elephant is equally episodic and slowly paced, you feel, care, and to a degree understand the characters. in zero day, i kept waiting for the final shooting to happen just so the movie would end. in addition to the boring home videos, there is a meta self-awareness to cal and andre that are not in similar movies. cal and andre opens a safety deposit box so that their videos would be send to network news anchors, and they burn all their cds, movies, and video games so that pop culture won’t be blamed for their massacre. one of their last videos shows them claiming their love for their parents and that it’s not their faults. they feel that it’s something that has to happen. they also talk about their planned massacre coldly and methodically, which would work in a dark comedy like american psycho, series 7 the contenders or natural born killers, except there is nothing funny or satirical here. and do we really need a dark comedy/satire on such tragedies? i guess it’s supposed to bring up the point that there isn’t a single reason that these tragedies happen. not video games, not music, not books, not guns, not social life. and any sane person would agree with that. but they don’t seem to want to commit to this position either. there are numerous references to the columbine massacre, one of them is wearing a marilyn manson t shirt, there’s the security camera footage we see at the end that echo the columbine massacre. there are scenes of the two leads being bullied and getting revenge on the jock, which seems to provide the only reason for their action, and at odds with what the rest of the film is trying to get across. elephant is still one of the best movie on the subject, it’s an 80 minute movie that feels like two hours long. zero day is 92 minutes but it feels like twice as long. it’s not interested in creating story or characters but rather a mouthpiece for the filmmaker. it’s reactionary not so much to the school shootings but rather the media coverage to them. i guess it would be interesting to someone who doesn’t already think that mass media and cable news are sensational and simple-minded.